We have been celebrating the holidays with our great friends for many years. Each year I bring the same thing. Not this year! When I received the Leafcutter Designs Cocktail Dice, I decided to “roll the dice” and see what cocktail I could bring to the party! At first I wasn’t sure how the ingredients would “play” together, but the end result was delightful! Everyone enjoyed the libation and I was thrilled! It isn’t everyday you get to roll the dice and have the perfect result! 4 ounces of freshly squeezed Ruby Red grapefruit. Your yield will vary on the juice of the grapefruit. Fill a cocktail shaker with ice. Add all of the ingredients and give it a solid 1 minute shake! 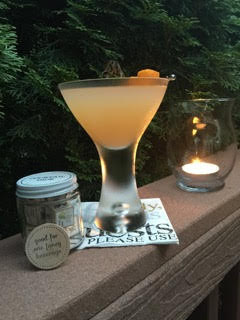 Strain into a chilled Martini glass and garnish with the orange peel. This was a very delightful cocktail! It is always an adventure when you “Roll the Dice”. Meet our newest cook, Melissa Cook! Meet our newest cook, Lindsay O'Connor! Meet our newest cook, T.S. Lamb! Meet our newest cook, Glenn! Meet our newest cook, Doug!